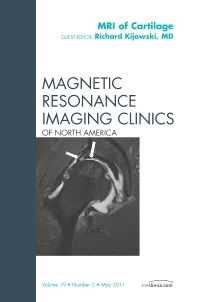 This issue reviews the latest advances in imaging of cartilage using MRI. A basis for understanding cartilage is provided in articles on normal anatomic appearance, morphology, and physiology. MR imaging of cartilage in specific joints such as knees and ankles, hip, and upper extremity are reviewed in separate articles, and assessment of rheumatoid conditions and cartilage repair are also covered.